Short Info: Reserve Bank of India has declared RBI Junior Engineer (Civil/Electrical) Exam Dates. The examination is to be held on 23rd February 2019. Candidates who have applied for RBI JE Recruitment 2018 are able now to download their admit card. Reserve Bank of India has successfully invited the candidates to fill up the 24 vacant posts for Junior Engineer posts. Now, RBI has issued the RBI JE Admit Card 2018. So, candidates who are going to appear in the written examination on 23rd February 2019 need to download their admit card. 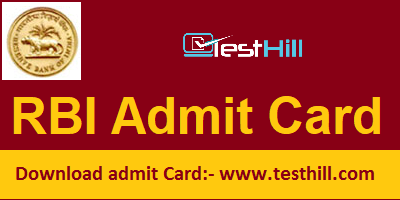 Candidates should download their admit card before the exam. They can download it by the below-given link. RBI Admit Card is out now for RBI JE examination. Candidates can download it by implementing the required information. They need to implement Registration Number or Roll Number and Password or Date of Birth. The admit card is granted by ibps.sifytest.com. So candidates need to download it from there. The RBI admit card is a key to appear in the written examination. Because without the admit card, the candidates will not be able to access the exam. So, every applied competitor need to bring RBI Admit Card 2018-19 with him/her. The authority will not send it to anyone’s house. So, they have to download it themselves. Hall ticket covers some valuable data about the applicant and the examination like name, photo, exam center, date, and address etc. So, by the admit card, the doorkeeper of the entrance gate can approve the applied candidates.